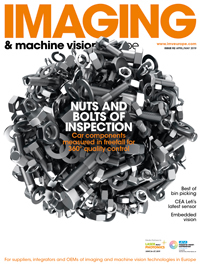 In the last ten years, the market for industrial image processing has more than doubled; new imaging modalities, such as polarisation, are becoming increasingly important. The Fraunhofer Institute for Integrated Circuits IIS has developed its Polka sensor, camera hardware, and operating and analysis software for imaging polarised light. The camera, Polka2, is available as a prototype and is currently being used in industrial in-line inspection. Polarisation is a dimension of light that humans cannot perceive. However, it is a fundamental property of light used in many ways by animals – mosquitoes find water to lay eggs thanks to the polarisation properties of light reflected from the water’s surface, for example. Detecting and measuring polarisation is usually done with filters. In order to detect the degree of linear polarisation (DOLP) and the angle of maximum polarisation (AOMP), in addition to the intensity of light, several measurements need to be made with different filter orientations and combined. This is possible using a rotating polarisation filter taking sequential images, although the technique is limited to capturing stationary objects. Similarly, as with colour cameras, a polarisation pattern – for example, with four polarisation orientations – can be used. A filter glued to the sensor can achieve this in principle but, with small pixels, the distance between the filter surface and the pixel is noticeable as optical crosstalk. A team at Fraunhofer IIS in Erlangen, Germany has developed an image sensor integrating the polarisation filters in chip production. The filters are therefore perfectly aligned and have minimal spacing in front of the pixel, all without extra processing steps . This image sensor, which is unique today, has been built into an industrial camera – available as a prototype – making it possible to record the polarisation properties of light in a single image. Various industrial processes and test systems can use polarisation directly. 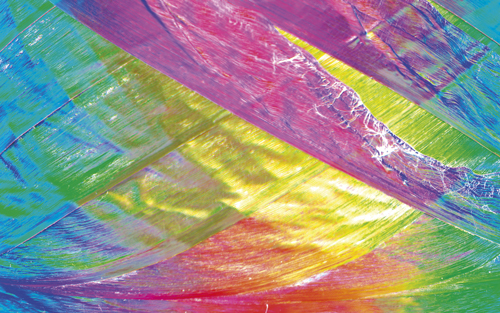 In glass production, for instance, the stress birefringence – which can be detected using polarised light – gives a measure of stress in the glass from improper cooling. Normal drinking glasses, container glass, as well as flat glass, construction glass and special glasses are relevant test objects. The birefringence is also present in plastics and polarisation can be used to analyse defects formed during injection moulding. When fabricating carbon fibre composites, the polarising effect of the fibres can give the orientation. This is relevant for the stability of the manufactured part. Polarisation information can also distinguish between natural and artificial objects in autonomous driving. A major challenge of this new imaging modality is that humans cannot see polarisation directly, so analysis is necessary to find out whether polarisation adds value to a machine vision solution. For this reason Fraunhofer IIS has set up a polarisation laboratory, which offers sample evaluation and application development. Jürgen Ernst, Stephan Junger, Harald Neubauer, Vladimir Tschekalinskij, Nanko Verwaal, Norbert Weber, ‘Nanostructured optical filters in CMOS for multispectral, polarisation and image sensors’, Microelectronic Systems. Berlin Heidelberg: Springer, pp. 9-17, 2011.